Main works: Declaration of Independence (1776), Notes on the State of Virginia (1787). Bibliography: H. Bullock Tompkins, Bibliotheca Jeffersoniana: A List of Books Written by or Relating to Thomas Jefferson (New York, Putnam 1887); E.L. Huddleston, Thomas Jefferson: A Reference Guide (Boston, G.K. Hall 1982); F. Shuffleton, Thomas Jefferson: A Comprehensive, Annotated Bibliography of Writings about Him (New York, Garland 1983). Catalogue of the Library of the United States, to which is annexed a copious index, alphabetically arranged (Washington, Jonathan Elliott, 1815). E. Millicent Sowerby, Catalogue of the Library of Thomas Jefferson (Washington, Library of Congress 1952-1959). J. Gilreath and D.L. Wilson, Thomas Jefferson’s Library: A Catalog with the Entries in His Own Order (Washington, Library of Congress 1989). After a fire in 1770 destroyed the library that Jefferson had collected as a young man, he began a new collection in the following decades and sold it to the U.S. Congress in 1815. This collection became the original nucleus of the Library of Congress, and though another fire in 1851 destroyed some of Jefferson’s books, many still remain in the library’s collection. A catalogue was printed at the time of the sale, but it has been superseded as a reference tool by the five-volume catalogue compiled by E. Millicent Sowerby in 1952-1959; this edition remains the essential source on Jefferson’s personal collection, though it should be considered together with a contemporary catalogue discovered more recently that regards the same sale made by Nicholas Philip Trist, Jefferson’s secretary and published by James Gilreath and Douglas L. Wilson in 1989. 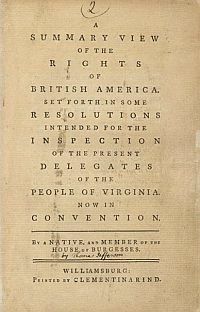 After the sale to Congress, Jefferson continued to acquire books, and various lists of two later libraries, referred to as the “Retirement Library” and the “Poplar Forest Library” have survived, including a list in Jefferson’s own hand and an 1829 auction catalogue compiled by a book dealer, Nathaniel Poor. In all of his libraries Jefferson used a highly sophisticated system of cataloguing and book classification that was inspired by Enlightenment ideals of universal knowledge. The Sowerby catalogue preserves this system of classification, dividing texts under three broad headings, History, Philosophy, and Fine Arts, and includes complete bibliographic information as well as citations of books from Jefferson’s correspondence. 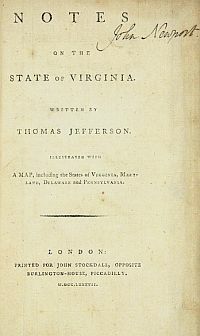 Both the Library of Congress and the Thomas Jefferson Foundation at Monticello have created online resources related to Jefferson’s libraries. 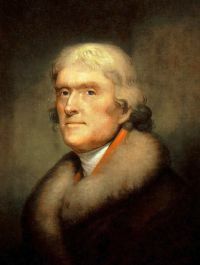 The Jefferson foundation site contains a list of all extant materials, as well as a searchable database of some of the most important catalogues. The site is still under construction and should not be considered comprehensive. The Library of Congress site includes a complete copy of the Sowerby Catalogue, the manuscript of the Trist Catalogue, and the printed catalogue of the 1815 sale. The Library of Congress: Thomas Jefferson's Library.